Take Care of Your Oral Health in 2019 By Scheduling With a Dentist in Plano! These days, there’s a lot of information out there about how to stay healthy, like eating less sugar or walking 10,000 steps a day. But one thing you don’t hear about as often is your oral health. And it turns out that healthy teeth and gums not only help your smile look and feel great, but also contribute to your physical health as well. 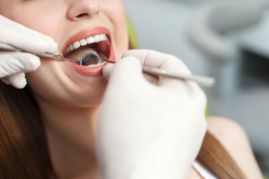 One of the best ways to improve your oral health is scheduling a checkup with a dentist in Plano, and, since the year just got started, it’s a perfect time to do that. Keep reading to learn about the many ways checkups benefit you and how they can help you achieve great oral health in 2019! How Do Checkups Benefit You? Your gums – You might be surprised to hear it, but gum disease is the leading cause of tooth loss – and millions of Americans have some form of it. Gum disease also affects your general health by increasing the risk for heart disease, Alzheimer’s, stroke, pregnancy complications, and even some cancers. Emergency prevention – No one wants to deal with a dental emergency at an inconvenient time like a vacation or a busy work day. Regular dental care is the best way to prevent these situations because undiagnosed issues can be caught and treated when it’s convenient. Your overall dental health – When a dentist does an exam twice a year, they’re able to find problems when they’re small and easier to treat. For example, small cavities can be repaired with a simple filling rather than a dental crown. Also, don’t forget that checkups are typically covered at 80%-100% for people with dental insurance. At the very least, everyone in the family should be taking advantage of this and getting 2 checkups a year – for little to no cost! How Can You Maintain Your Oral Health Between Visits? Do well with brushing and flossing. Your habits don’t have to be perfect, but try to be as consistent as possible. Limit the amount of sugar you consume. Also, try not to snack or sip on anything sweet throughout the day. The more frequently your teeth are exposed to sugar, the more likely they are to develop cavities. You might also benefit from one of the many tools available today to make your hygiene routine more effective. That could be anything from an electric toothbrush, oral irrigator, floss picks, interdental brushes, or a fluoride mouthwash. It’s a brand new year, so why not take advantage of the fresh start by scheduling a checkup? It’s a great first step towards achieving a healthy smile in 2019! Dr. Christina Ky is a family dentist in Plano and a graduate of Baylor College of Dentistry. With nearly a decade of experience, she’s found that patients who get consistent checkups have better overall health than those who don’t, so she encourages everyone to come in regularly. If have any other questions or would like to schedule an appointment, she can be contacted through her website. Comments Off on Take Care of Your Oral Health in 2019 By Scheduling With a Dentist in Plano!